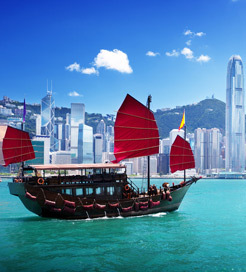 There are 4 ferry routes operating between Macau and Hong Kong offering you combined total of 158 sailings per day. TurboJet operates 7 routes, Macau (Outer Harbour) to Hong Kong (Sheung Wan) runs 78 times per day, Macau (Outer Harbour) to Kowloon about 16 times daily, Macau (Taipa) to Hong Kong (Sheung Wan) about 7 times weekly, Macau (Taipa) to Kowloon about 14 times weekly, Macau (Outer Harbour) to Hong Kong Airport (Skypier) about 5 times daily, Macau (Outer Harbour) to Tuen Mun about 7 times daily & Macau (Taipa) to Tuen Mun about 7 times weekly. Cotai Water Jet operates 3 routes, Macau (Taipa) to Hong Kong (Sheung Wan) runs 35 times per day, Macau (Taipa) to Kowloon about 7 times daily & Macau (Taipa) to Hong Kong Airport (Skypier) about 6 times daily. As the frequency and duration of crossings on some routes varies we would advise that you do a live search for crossings from Macau to Hong Kong to get the most up to date information. 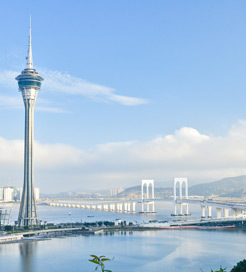 The tiny Special Administrative Region of Macau lies 65 kilometres west of Hong Kong. Defined by Portuguese colonial architecture and contemporary casinos, Macau is a fascinating mix of cultures. One moment you’ll be admiring 17th Century church ruins, then you could be sampling authentic Chinese food whilst relaxing in a modern sky lounge. As one of the earliest European colonies in Asia and the last to be relinquished, Macau has spectacular historical landmarks around every corner. The most popular include the Ruins of St Paul's Church and the small village of Coloane which was a haven for pirates and privateers until 1910. Travelling by ferry is a popular mode of transport in Macau and it boasts excellent services from its two ports. There is a large number of high-speed crossings to many destinations in China, all operated by some of the region’s leading ferry companies.